A GRAND alliance of parties opposed to the BJP will come together in some states for the Lok Sabha elections next year, and while the alliance may not work in some states, it does not mean the alliance is in tatters, as Prime Minister Narendra Modi asserts, former PM and JD(S) chief H D Deve Gowda said on Saturday. 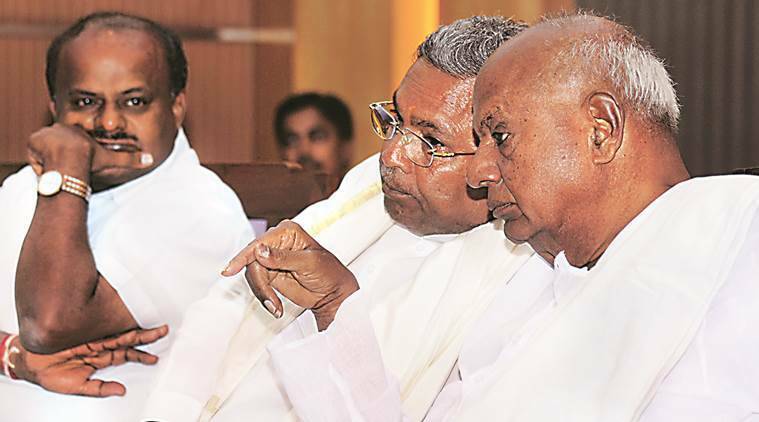 Calling the BJP a “common enemy”, Deve Gowda announced that the Congress-JD(S) alliance forged in Karnataka after the Assembly polls in May will be taken forward to the bypolls in the state next month and the General Election next year. Talking about the import of the upcoming bypolls in Karnataka for the anti-BJP forces elsewhere in the country, Deputy CM G Parameshwara of the Congress said in the same press conference that the upcoming by-elections are an “opportunity to show the country that secular forces can unite to defeat the BJP”. Chief Minister H D Kumaraswamy of the JD(S), his predecessor Siddaramaiah of the Congress, and state Congress chief Dinesh Gundu Rao were also present at the press meet ahead of the November 3 bypolls to Shimoga, Mandya and Ballari Lok Sabha seats and Ramanagaram and Jamkhandi Assembly seats. “In some states there may be seat-sharing, and in some states it may not be successful. But that does not mean the (anti-BJP) coalition has been destroyed. The Prime Minister has been saying that the alliance is in tatters,’’ Deve Gowda said, in reference to the BSP’s refusal to team up with the Congress in Chhattisgarh and MP.